Since the time MY plantar fasciitis launched from a tissue-traumatizing heel impact September 2011; through countless hours of telephone interviews, for this Web site, with doctors and other medical personnel and scientists; through testing what I learned, using myself as lab rat; to the present state of cure and beyond: Here’s the story ( ♫ of a lovely lady ♪ ) in a nutshell. The Attack of the Plantar Fasciitis Monster came to me, as it probably comes to everyone, as a sobering surprise after a life of assuming that the heel was one solid piece that would never turn on me like those other aches and pains I like to refer to as Bob’s Probs: iffy lower back with occasional spasms; rotator cuff problems in one shoulder; acid reflux; occasional weakness and twinges in the knees; and a just plain ugly face. Back in the summer of 2011, before the PF hit, I was still living in those happy innocent days of imagined heel indestructibility. 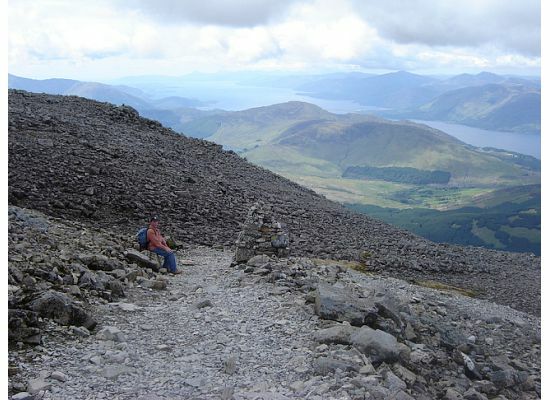 Here’s me on the last big innocent hike, the 9-hour up-and-down of Ben Nevis in Scotland, the highest point in the UK. It should have take less than 9 hours, but on the way down I had to support a person whose knee had gone out. I was smug with pity for this poor imperfect person, because I could walk all day without even the slightest twinge to suggest that even in my wildest imaginings that the heel was not an indestructible solid. A year later, I’d have been the one who needed tending. But now, years after my PF was cured and after years of ri-DIC-ulous hikes with no pain, I’d sure like to do old Ben again because hiking — let alone walking — no longer holds any worries for footal function. My story — like many stories of how we hurt ourselves — began with stupidity. Looking back beyond when I first noticed something serious was wrong, I see a day in the woods by a river in Nebraska when I was stomping on sticks to break them for firewood. I was wearing tennis shoes. You need a big shoe with a hard sole, if you’re going to stomp wood. Stupidly, I stomped thicker and thicker branches until I couldn’t break one. Tossing caution to the wind, I stomped really hard until, the branch not breaking, I felt a pain, like I’d broken or torn something in my heel. Duh. Recovery makes a halting start. At my first visit to a podiatrist in the Spring of 2012 where I got the word that yes, my problem was definitely plantar fasciitis, I got advice on stretching, icing, wearing shoes with flexible soles and tight heels, taking anti-inflammatories and using arch supports and cushioning insoles. My podiatrist even sold me her recommended over-the-counter arch support: the Blaue Fussbett [the blue foot bed], by Birkenstock, a pair costing around $60. The Blaue Fussbett definitely help, but not enough, and I barely made it to a limping conclusion of the exploration season. So I went to a local outlet of the Good Feet Stores and bought their program. The Good Feet Store has arch supports that cost enough to dissuade me from buying more than the two pairs I needed for their program. HOWEVER, the Good Feet Store program does have other benefits that make it worthwhile, though, and you can read the skinny on that in The Good Feet Stores. AND, the other crucial element driving a cure, in my opinion, was faithfully following a program of the proper daily stretching exercises, and you can see that in our Stretching section. Walking barefoot. Discovered that, as the docs say, best not to do it. Easiest time to say, oh what the heck, and go barefoot anyway is when one gets up from bed in the night, or in the morning. My solution: keep just one slip-on shoe, for the appropriate foot, at the edge of the bed where it’s easy to slip into when you head for the can in the wee hours. I used one of those Dutch-boy-looking Dansko shoes, or one of the Merrell slip-ons, with an orthotic in it of course. Nowadays, being “cured,” I often walk around in socks but only for brief periods. Actually, even after the cure, walking around too much can give you a scare. Getting lazy, I was more often walking barefoot rather than putting on a shoe with support, but to avoid walking on the plantar fasciia I had been walking on my toes and the ball of my foot like animals do, thinking that should be a natural thing. After all, what is a heel in us is halfway up the back of the leg in a dog, so they’re walking on their toes. But suddenly the mid-to-fore foot felt damaged and it was, several times, painful when walking. Then I remembered a conversation I had with Dr.John Wilson, a faculty member in the University of Wisconsin School of Medicine and Public Health, and a team physician for the University of Wisconsin Athletic Department. The conversation was about walking barefoot. I was up in the mountains hiking in Colorado’s Staunton State Park. The temperature was bracing cold, a dusting of snow was in the woods and there were patches of ice on the path, but the sun was out and the golden aspens were aglow and it was a beautiful day. And no pain. That was when I pronounced myself cured. Sure I can still feel that place, feel that my plantar fascia (right foot) is not the virgin tissue it was. I can feel it especially when I walk around barefoot, that knot, and that shifting of the tissue with each step that tells me that if I were to stop wearing the right shoes and orthotics; if I were to stop making sure not to walk around the house barefoot or just in socks, doing the proper stretches, it could come back. So I wear the right stuff and do the right stuff, and it’s cured as far as I’m concerned.